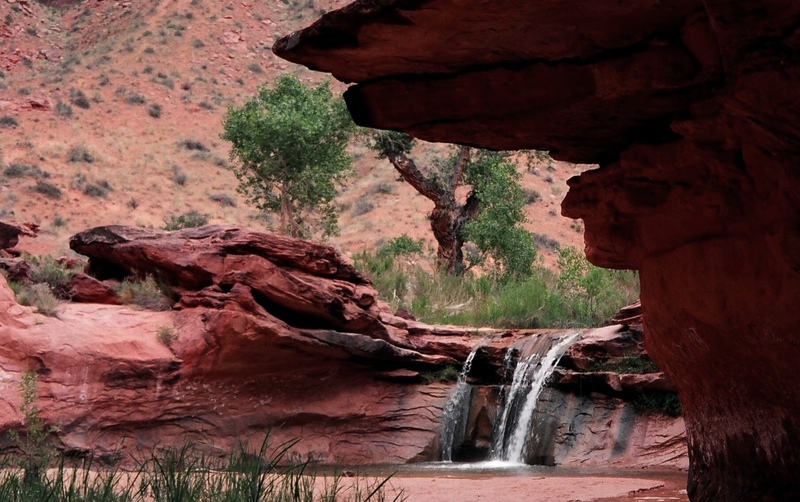 This entry was posted in Utah and tagged Backpacking, Hiking, Hiking (2), Landscapes, Nature, Photos, Pics, waterfalls. Bookmark the permalink. So beautiful ! One day I’ll make it there. That’s not just any waterfall, it’s in a lovely canyon called Coyote Gulch in the Grand Staircase Escalante, which is an exquisite backpack in beautiful canyon country. If you saw that waterfall, you saw a lot of other ‘natural’ beauties as well. Thanks for the correction, Suzanne. I have not been there. The photo was in a collection of photos given to me by my dad who took the picture and I mistakenly thought it was from his Green River trip last year. For an intrepid hiker like yourself, I highly recommend you put Coyote Gulch on your bucket list. Not only will you be able to cool yourself in that beautiful spot on the stream that flows into the Escalante River, but you will hike in slot canyons, see natural bridges, arches and have a very pleasant visit to a superb spot in one of my favorite playgrounds. Your dad had to have been backpacking to take the picture because it’s generally not do-able in a day. Lucky, and smart, of him to have visited there. If you would like any info on the the GSE, I’d be happy to provide. Thanks Suzanne. I definitely feel lucky to have made that trip. It was an amazing five days. Coyote Gulch is one of my favorites of all the canyons I have hiked and kayaked in Utah over the years. The diversity of the awe inspiring sites and geological formations that one encounters in that canyon are hard to match anywhere else. Thank you Suzanne. Yes I definitely feel lucky to have made that trip. The credit goes out to a backpacking mate of many years who recommended the trip. It was an amazing five day trip and one of my favorites of all the canyons and mesas I have explored in Utah over the years.